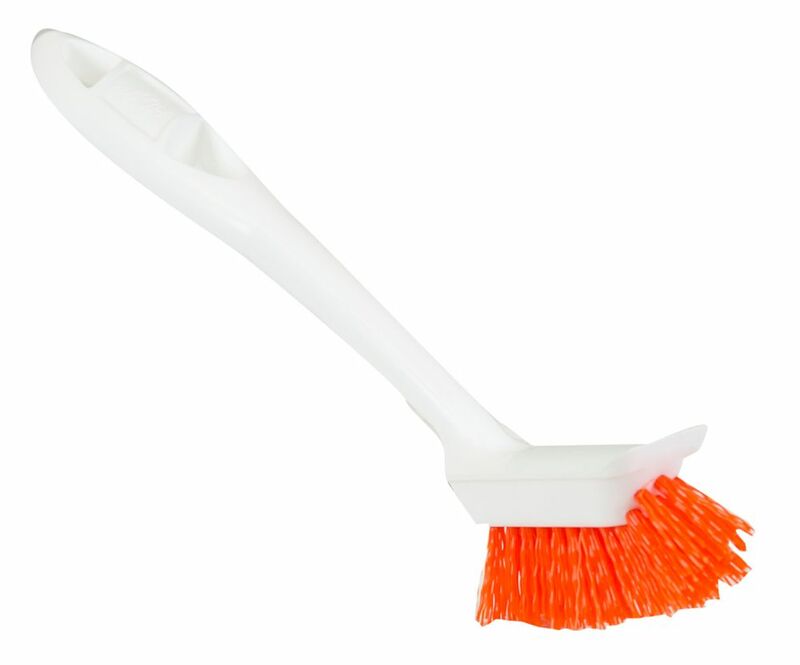 Clean tile and grout with this specially designed poly-fibre brush. The curved tip of the brush fibres cleans into crevices and corners without scratching. Works on all tile floors, baths, countertops and backsplashes. Ergonomic soft-grip handle maximizes gripping effort and comfort, solvent resistant and easy to clean. Ideal for: scraping paint, removing rust, cement and other heavy-duty applications. Designed with comfort and versatility in mind, the Quickie 2-in-1 Grout Brush fits comfortably in the hand for scrubbing of grout lines. A removable detail tool built into the handle features a rubber tip scraper, great for cleaning grout lines and getting into small crevices. An antimicrobial protection of the bristles reduces growth of odor causing bacteria, mold and mildew. Tile & Grout Brush Clean tile and grout with this specially designed poly-fibre brush. The curved tip of the brush fibres cleans into crevices and corners without scratching. Works on all tile floors, baths, countertops and backsplashes. Tile & Grout Brush is rated 3.8 out of 5 by 6. Rated 3 out of 5 by Lori from Not a very sturdy tool. I ended up purchasing... Not a very sturdy tool. I ended up purchasing an additional three brushes to complete 1100 sq ft. Rated 5 out of 5 by Texaslady79424 from The best little grout brush ever!!!!! WILL buy again. The best little grout brush ever!!!!! WILL buy again. Rated 5 out of 5 by Lori from Great product for the price I clean homes professionally and this is a decent scrub brush for grout. Holds up to numerous scrubbings. We toss them when the bristles get bent. The only thing that would make it better would be to have a cleanser dispenser built into the handle. Rated 4 out of 5 by RednexToyz from Stiff Brush Brush was quite stiff so be sure & not use it in an application where scratching can occur. Bristles continue to form a slight bull-nose towards the tip of the brush allowing easier cleaning in corners or rounded areas. Holds up well.